The iconic eagle emblazoned on the signage outside Chávez Law Group might be just an image to some. But in historically Latino Montebello, California, just east of downtown Los Angeles, the chance of meeting someone unfamiliar with the insignia’s homage to the United Farm Workers (the storied agriculture union cofounded by civil rights activist César Chávez and Dolores Huerta) is pretty slim. Many of the city’s residents have come to trust Fernando Chávez, son of César Chávez, and the man behind the national law firm that carries on his father’s cause. With affiliate offices in 22 states and attorneys specializing in everything from employment law and medical malpractice to personal injury and immigration, the Chávez Law Group is dedicated to fighting for fairness and justice. Given its lineage, however, it is the firm’s work around immigration issues that is making it a recognizable name in beyond Montebello. According to 2013 numbers released by Pew Research’s Hispanic Trends Project, there are 11.7 million undocumented immigrants currently living in the United States. The attorneys who advocate for their rights have proven to be just as crucial as activists and organizers in helping undocumented immigrants combat the exploitation they often face. Chávez says that when he began his firm in 2003, immigration wasn’t the hot-button issue it has become today. 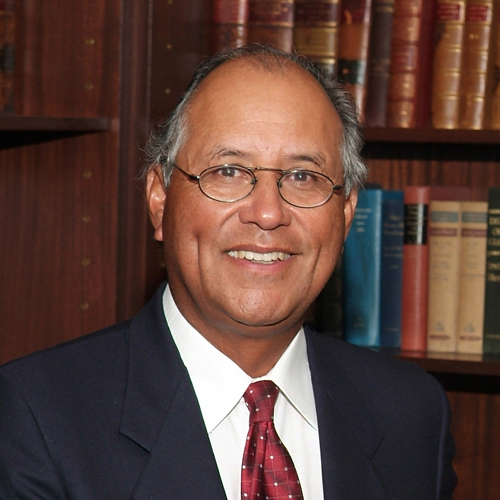 Chávez does not specialize in immigration issues as an attorney, but he considers himself an immigration rights advocate. At his Montebello office there are three attorneys who specialize in immigration. Using his success, resources, and innovative techniques, Chávez has continued his family’s legacy of activism with a contemporary focus. Such was the case with Antonio Lopez Chaj, an undocumented immigrant living in Los Angeles who made international headlines when he was severely beaten by a security guard in a Los Angeles bar on April 19, 2010. The beating left him permanently brain-damaged and physically deformed. His injuries were so grave doctors were forced to remove a portion of his brain and skull. As a result, Chaj cannot speak and requires assistance 24 hours a day. In July of 2013, Chávez and fellow attorney Federico Castelan Sayre helped Chaj obtain what is believed to be the boldest judgment in the history of the South Bay Court—which is notorious for conservative decisions. The court awarded Chaj $58 million in economic and medical losses, future medical expenses, and lost earnings, in addition to pain and suffering. In a statement after the judgment, Sayre said Chávez Law Group is dedicated to fighting for the civil rights of undocumented immigrants—and there are endless opportunities to do this crucial work. Chávez is keenly aware that cases related to immigration are only set to increase, and as his firm continues to expand and open new offices, he has gone out of his way to hire the best and the brightest who can tackle even the most complicated immigration cases. When looking to hire a team for Chávez Law Group’s new Los Angeles (LA) office, which opened in April of 2014, Chávez was seeking young, passionate, energetic lawyers—and whom he hired speaks volumes about the integrity of his firm and its dedication to equal rights. In mid-October, Chavez stated, “I strongly believe Obama is going to make a move on immigration before leaving office, and we want a great team in place in Los Angeles before it happens.” Ninety percent of those who applied for positions in the LA office were Spanish-speaking Latinas between the ages of 28 and 32. The office, therefore, is almost entirely run by Latinas who are smart, motivated, believe in the system, and are dedicated to helping US immigrants. 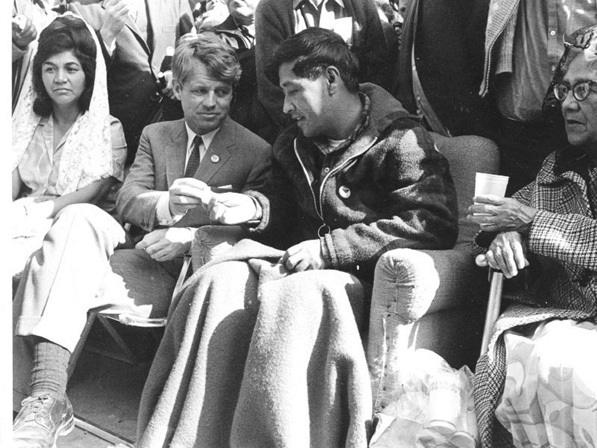 Robert F. Kennedy (middle) offers César Chávez (right) bread in a symbol of support at the end of Chávez’s 1968 hunger strike for farm workers in Delano, CA. Many law firms are expanding their services to take on immigration-related cases. Technically, this is a smart move, given the quickly changing dynamics of the country, but too often immigration cases are treated as publicity-fueling, money-making endeavors rather than actual commitments to fighting for the civil rights of one of the country’s most vulnerable communities. What complicates the issue further is President Obama’s public support of immigration reform contrasted by his administration’s quiet deportation of more undocumented immigrants than any administration in US history. And each year it only gets worse. In October of 2014, the Department of Homeland Security reported that the Obama administration deported a record 438,421 undocumented immigrants in fiscal year 2013, resulting in more than two million deportations since President Obama took office in 2008. Chávez has ideas about what is in store for immigration reform, but even with a niece in the White House (Julie Chávez Rodriguez, granddaughter of César Chávez, is the White House deputy director of the Office of Public Engagement), one can only speculate on the future of the bill. After a bipartisan comprehensive immigration reform bill passed the Senate with promise in 2013, it met its demise in the House of Representatives last summer. It was never brought to a vote. Months later in early September 2014, President Obama announced he would postpone action on his promise to remake federal immigration policies through executive authority until after midterm elections. Yielding bicameral Republican control of Congress, the election results suggest continued gridlock. Republican majority in both houses will have an effect on any legislation involving social reform, and most importantly for Chávez’s clients, immigration. The president announced he would use executive action on November 20, 2014, extending protection to immigrants. It was risky, however. Speaker of the House John Boehner had expressed that any executive action by Obama on the issue of immigration would “poison the well” for Congress to move forward with reform. In an ideal world, Chávez says, comprehensive immigration reform would provide undocumented people with a pathway to citizenship. Deciding on a cutoff is the biggest challenge, he admits, but Chávez also says he feels strongly that those who have no substantial criminal record, who work hard, and who have been contributing to this country’s economic growth deserve to be given a pathway to citizenship. Deferred Action for Childhood Arrivals (DACA) does not offer citizenship, and the as-yet-to-pass Federal DREAM (Development, Relief, and Education for Alien Minors) Act only promised residency. Chávez is gearing up his firm with the expectation that, at the very least, President Obama will expand the guidelines for DACA, making it beneficial to a wider range of people. In its current form, DACA is only helpful to young, undocumented immigrants who were under the age of 31 as of June 15, 2012 and who entered the United States before the age of 16. The two-year-old policy gives recipients work authorization, a two-year reprieve from deportation, and a driver’s license. Needless to say, it’s an offering that has been life-changing for the almost 600,000 individuals who’ve been granted deferred action. DACA has also unfortunately opened the doors for exploitation. The paperwork required to apply for it, which largely requires providing proof of residence in the United States, is $465 and is relatively easy to complete without the assistance of a legal professional, but the legal profession has been preying on those desperate to be granted deferred action. Part of the reason Chávez’s firm has become such a trusted source is the same reason so many get turned away: he refuses to take someone’s money if he can’t do anything for them. In the past year, his firm’s website has received 18,000 inquiries, but only 150 have led to clients. Chávez’s firm could be making a nice chunk of fees off the undocumented immigrants who come in seeking assistance applying for DACA, but Chávez does his best to dissuade those who come in requesting assistance with their paperwork. “We recently had a client come in with his two daughters, one a student at Stanford and the other a student at UC Berkeley. He wanted help with DACA, and I told him, ‘You have two intelligent daughters going to top universities! Why are you here? Save your money and have your daughters do the application,’” Chávez laughs. Chávez recently inked a deal that will prove to be transformative for undocumented individuals that come into his office. Chávez Law Group will be the only firm he knows of utilizing advanced Web-based technology to cut down the costs clients pay for immigration services. Chávez suspects that if and when President Obama hands down his executive order, it will be broad enough to impact millions, and he wants to be in a position to help finance the application process for undocumented individuals who wouldn’t be able to afford it otherwise. The specifics are still in the works, but he’s hoping to be able to offer an Internet-based program for filing fees and attorney fees to be paid at a low monthly rate. Chávez insists he’s not worried because he’s familiar with the communities he serves and is willing to take a chance on them. He understands his latest idea might not be an initial money-maker, but in the larger scheme of things, it’s a risk that will ultimately pay off, and not just financially. Walking through the Montebello office, it’s clear something else is in the works. Cutting through the center of the building are six small rooms that are in the process of being outfitted with computers. The purpose: Chávez will make attorneys available for Skype sessions with clients across the country applying for documentation. His logic is simple: Speaking to a lawyer every day—or even every month—is incredibly pricey. Why not utilize the Internet to cut down on the cost to clients? Each client will be given a code, enabling them to access their file online 24 hours a day. This will allow clients to see where their application is in the process or what’s still needed to complete it. The firm is also making strides in the immediate community. Recently, Chávez struck a deal with the local school board to make use of an adult center by offering online consultations about legal rights. The program has the ability to reach 35,000 students, who can log on at any time and seek legal opinions on various issues. Being unconventional and thinking outside of the box has simply become a part of how Chávez’s firm operates—and it appears to run in the family. Last year at a Labor Rights Week event at the Mexican Consulate office in downtown San Jose, California, Chávez’s son Paul struck up a conversation with a woman who was seeking back wages from her former employer; the claim was a mere $300. Most firms wouldn’t touch such a case, as they’d make almost no money on it. Chávez felt similarly, but told his son to help if he felt compelled. Eight months later, Paul reported that he’d settled the case for $6,000. It turned out the woman’s former employer also failed to give her work breaks. Inspired by Paul’s work, the Chávez Law Group now has a wage and hour practice through which it takes on cases with smaller claims that other firms aren’t interested in pursuing, and it’s proving to be a successful addition to the business. Chávez explains that claims of this nature are often made by undocumented people earning low hourly wages. Exploitative employers see them as disposable people who, if not paid or given breaks, are afraid of complaining because they don’t want to lose their jobs or risk deportation. “There is a lot of abuse at the hourly income level,” Chávez says. The attorney understands why his profession has a bad name and is aware that legal professionals can be as exploitative as employers. Notario fraud has swindled many immigrants out of money and damaged their chances for immigration relief. Because notarios falsely identify as legal consultants, their unfortunate association with upstanding, well-meaning attorneys has tainted the relationship between immigrants and legal professionals. Chávez recommends having a good understanding of attorneys’ limitations and their area of expertise before choosing to work with them. If you have a very complicated immigration case, for example, it would be best to work with someone who specializes in immigration issues; not a jack-of-all trades attorney who does a little of everything. “Ask a lot of questions, and look for someone who’s honest and has a good reputation in the community. I’d also recommend being very careful about what you’re paying for. Just because someone is helping you with an application, doesn’t mean they’re an attorney,” Chávez says. When speaking to Chávez, it’s clear the work he does isn’t just a job. Of course, as the founder of the firm, he has to worry about the bottom line, but at no point does that seem to dictate his firm’s willingness to do the right thing. He understands that his approach helps him attain things money can’t buy: trust, respect, and loyalty­—increasingly rare attributes, especially in his field. EDITOR’S NOTE: At the time of press, President Obama had just announced the details of his executive orders on immigration, which plan to expand work visas and halt deportation for roughly four million undocumented immigrants who have been in the states for at least five years or are parents of US citizens. Both must pass a background check and pay taxes for temporary amnesty in order to “get right with the law.” These orders may date some of the statements made by Chávez and the writer.